You may have been reading about Bank of America short sale approval letters and some changes that have occurred. 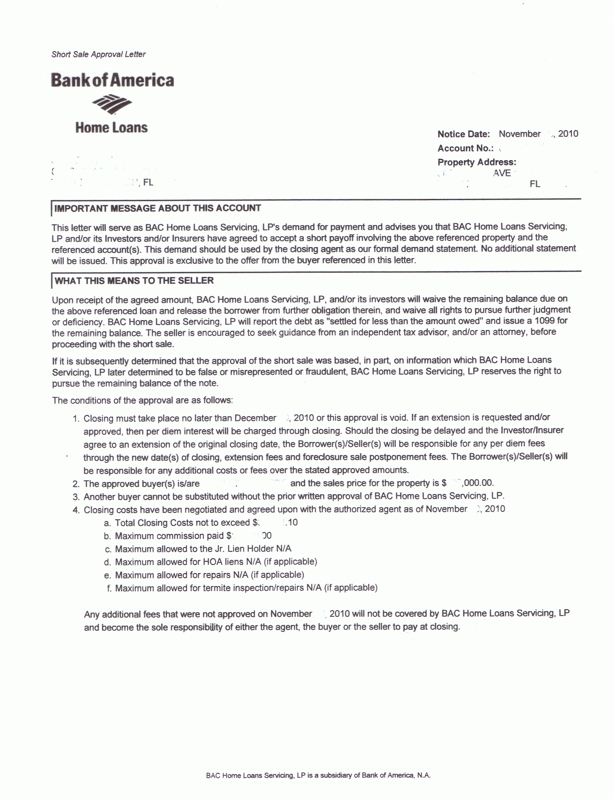 The Bank of America Short Sale Approval Letter has had various versions dealing with deficiency of the promissory note. This article will look at the BoA short sale letter recent changes. Until June 2009 the typical Bank of America short sale approval letter was not a release of mortgage and a release of liability of the indebtedness (release of the note). My February 2009 article LENDER SHORT SALE ACCEPTANCE LETTER EXAMPLES - READ WITH CAUTION! contains a copy of the pre-June 2009 short sale approval letter. In it you see the language, "Upon receipt of the funds the bank will release the lien. The deficiency balance will be reported to the credit bureaus as "Charge Off" collectable balance. Liabilities for the deficiency balance to be determined." After June 2009, the Bank of America short sale letter was materially changed in content and in look. The simple letter was gone. 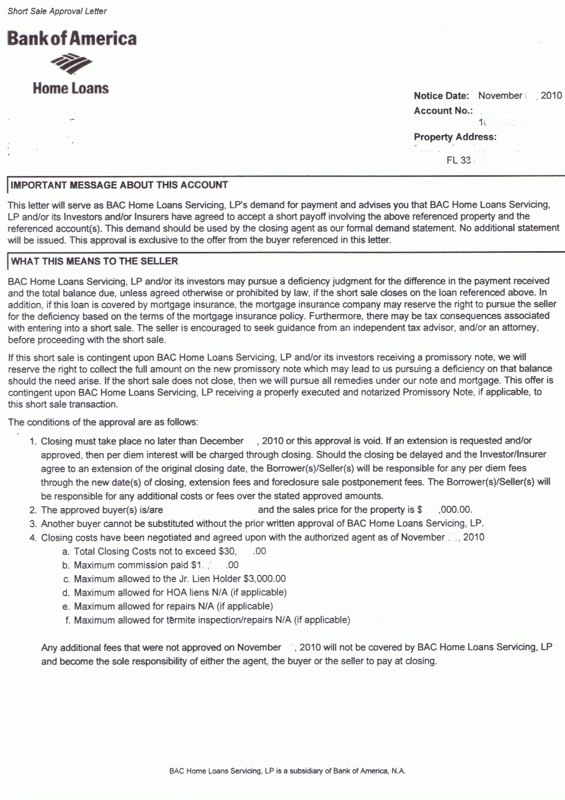 Now there was a form letter with distinct sections, one of which (the 2nd and 3rd paragraphs) states, "BAC Home Loans Servicing, LP and/or its investors may pursue a deficiency judgment for the difference in the payment received and the total balance due, unless agreed otherwise or prohibited by law, if the short sale closes on the loan referenced above." The next paragraph deals with the demand for a "new" promissory note with different terms than the original promissory note (usually with zero interest and a different term for amortization), and states, "If this short sale is contingent upon BAC Home Loans Servicing, LP and/or its investors receiving a promissory note, we will reserve the right to collect the full amount on the new promissory note which may lead to us pursuing a deficiency on that balance should the need arise. Beginning in late August 2010 (so I have read) the BoA letter language was material changed. The new form used language that states, "Upon receipt of the agreed amount, BAC Home Loans Servicing, LP, and/or its investors will waive the remaining balance due on the above referenced loan and release the borrower from further obligation therein, and waive all rights to pursue further judgment or deficiency. BAC Home Loans Servicing, LP will report the debt as "settled for less than the amount owed" and issue a 1099 for the remaining balance." Now I have my hands on just such a letter. The first paragraph in the above letter is actually very confusing and conflicting in its language. The reason for this is that the last two sentences that refer to tax consequences makes the reader think that this is a forgiveness of debt. This is because there are no material tax issues with the lender pursuing their deficiency - but there are definitely tax consequences when there is forgiveness of debt. (See my article which by its title says it all -- SHORT SELLER STILL MUST DECLARE INCOME ON SALE!). Why that language was there was because the lender "may pursue a deficiency judgment". In reality, from our experience many of the release of mortgage documents received from Bank of America after the short sale using this letter contains language that the promissory note is "fully satisfied" or "paid in full" or that the "indebtedness is satisfied", or similar language. In a few cases our clients reported collection efforts instituted by BoA, but in each the presentation of the recorded release document with the magic payment statement resulted in the collection effort being seemingly abandoned. Five years (the Florida statute of limitations to file a suit on the deficiency) has not yet run, so this supposition still has some time to be proven. The next paragraph in the above letter is about the collection on a promissory note and is simply that the new note is a new obligation and thus the lender can sue separately on this note if it is not paid. That is simple enough. When there is an absolute need for a promissory note, I suggest to some clients to accept that offer because many of these notes get further reduced based on a present cash value payout since the NPV (net present value) of a zero percent interest note for a relatively long term (we see 10 and 20 year terms) carries a hefty discount. It takes some time (but not much) before a deal can be struck for a discount, but could be a viable option for a seller. Next I have displayed the new BOA short sale approval letter. Unlike its predecessors, it is the first clean, clear and understandable full deficiency waiver letter Bank of America has produced. Since there is no new promissory note, that paragraph is missing. The language is so clear; I don't see what I can add in this article to make it more understandable. As expected, it mentions that a 1099 will be issued for the forgiven portion of the note, and there will be unfavorable but accurate credit reporting on the borrower's credit report. The next sentence in the letter is actually important. Some people are actually worse off because of a short sale with forgiven debt because they are liable for the IRS tax bill that results. If the IRS tax bill is a debt that will be impossible for the borrower to honor, and no arrangement for lessening that debt is available, the borrower may actually be jumping from the frying pan into the fire. In such cases some other alternative, such as bankruptcy may be beneficial. Note that if you incur a tax liability from a short sale forgiveness before filing bankruptcy, it may not be dischargable! Thus careful planning is necessary. Please realize that currently BoA is using both letters, depending on numerous factors not all of which anyone outside (and probably inside) BoA can recite with certainty. In fact you can see that these letters were both received in first 2 weeks of November. The question comes up when does BoA issue one letter or the other?? My first thought would be that the primary residence got the waiver language. Wrong! This was an investment property and the seller has multiple properties. As you may or may not know, BOA is usually not the investor who owns the promissory note and mortgage - but BoA is the servicer and given the authority to negotiate the terms of the short sale, subject to final approval by the investor. That is why different lenders have BoA issue different terms for their short sale approvals, whether it be a contribution of cash to the short sale, or a post closing promissory note, or a residual deficiency option. Richard Zaretsky, Esq., RICHARD P. ZARETSKY P.A. ATTORNEYS AT LAW, email: [email protected] - FLORIDA BAR BOARD CERTIFIED IN REAL ESTATE LAW - We assist Brokers and Sellers with Short Sales and Modifications and Consult with Brokers and Sellers Nationwide! [email protected] New Website www.Florida-Counsel.com. I just got another BOFA approval today - the "old" letter. I asked the negotiator if they can control what is issued. She said if this investor seller had paid 10% of the balance as a cash contribution, they would have. She also said they had a formula, part of it includes if the seller ever occupied the property as a primary residence. Good stuff Richard. My last 2 shorts with BofA have had the new letter. My sellers were very pleased. Richard - Excellent synopsis and evolution of BOFA short sale approval letters. I hope they migrate more to the newer version.